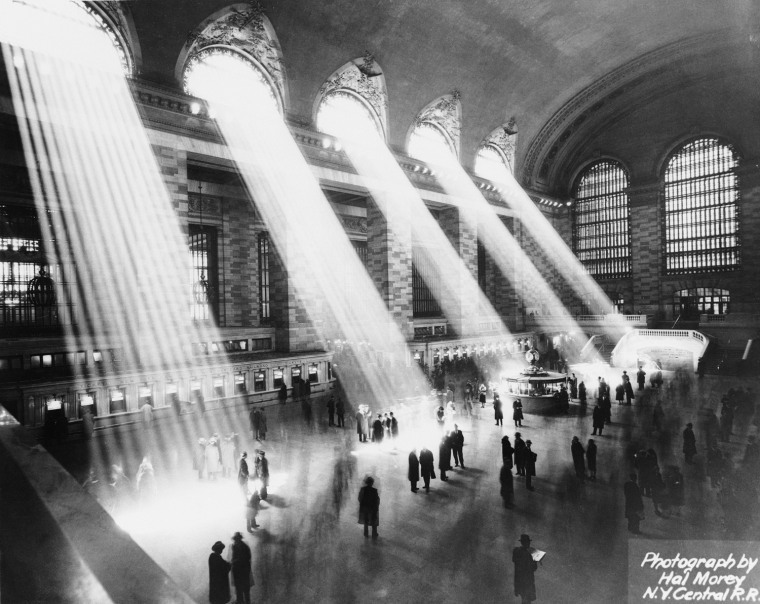 Beams of sunlight stream through the windows at Grand Central Terminal in this photo, circa 1930. 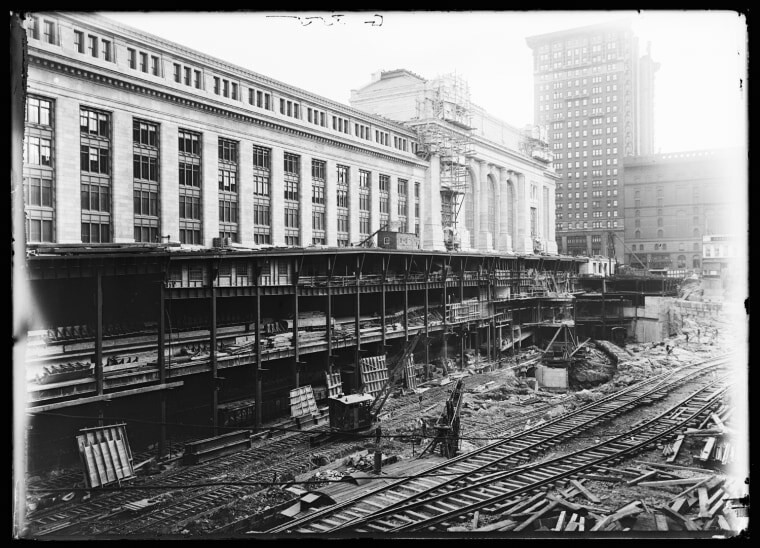 Grand Central Terminal, under construction in this photo believed to be taken between 1905 and 1915, was opened in 1913. — Detroit Publishing Co. / Detroit Publishing Co. 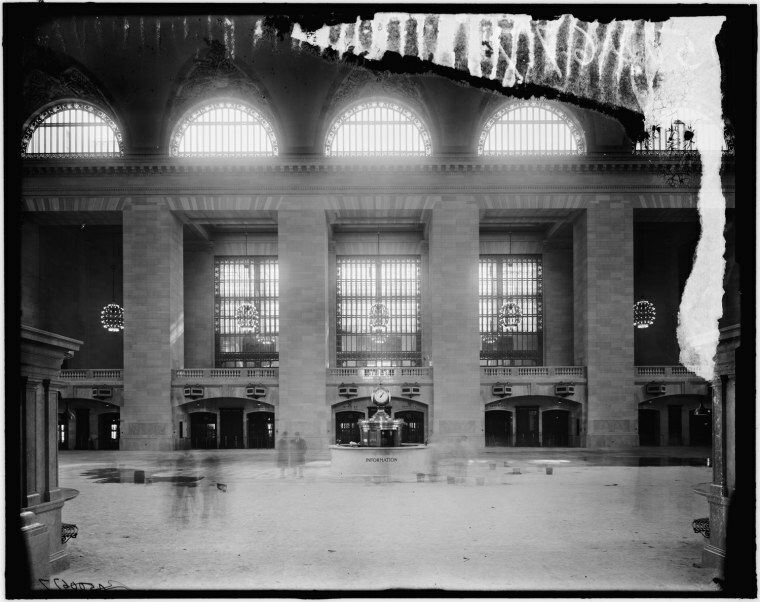 The first train left Grand Central Terminal just after midnight on Feb. 2, 1913. 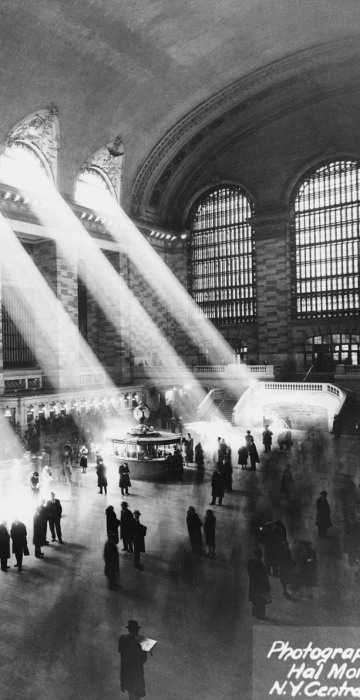 One hundred years later, the terminal is the second-most visited attraction in New York City, behind Times Square, according to the Metropolitan Transportation Authority. 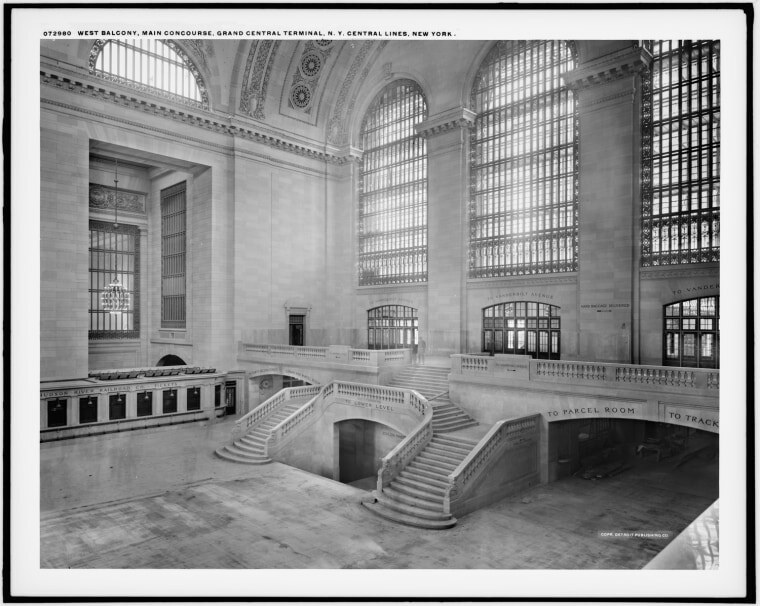 The west balcony of Grand Central Terminal is pictured between 1910 and 1920. 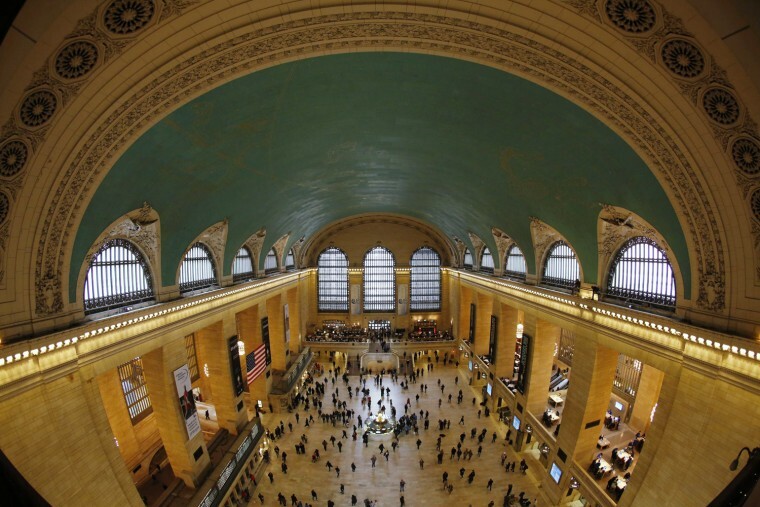 Grand Central Terminal is “truly one of the greatest buildings in this country if not the world,” said Justin Ferate, a longtime New York tour guide. 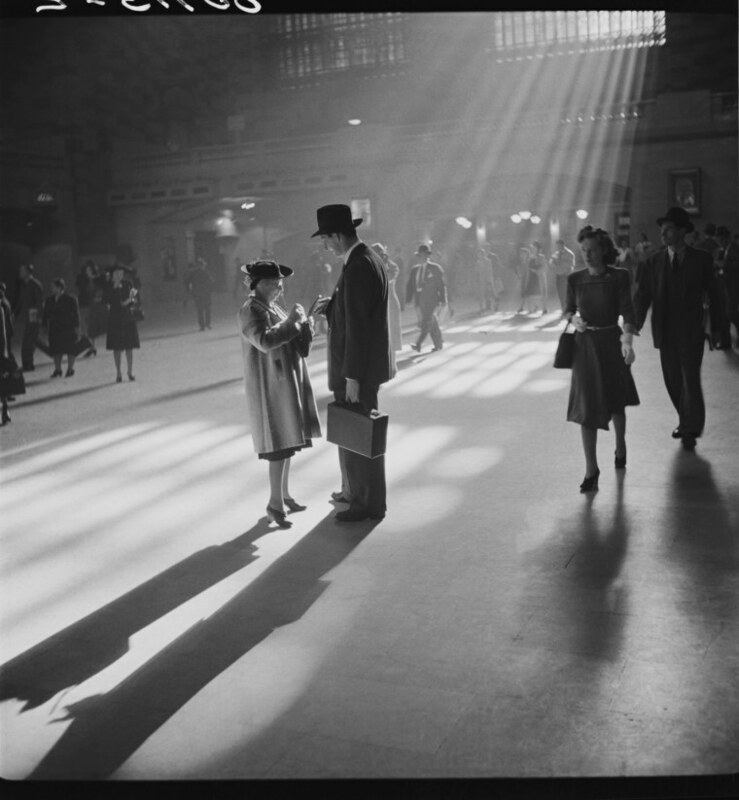 Passengers are seen moving through Grand Central Terminal in this photo published in 1941. 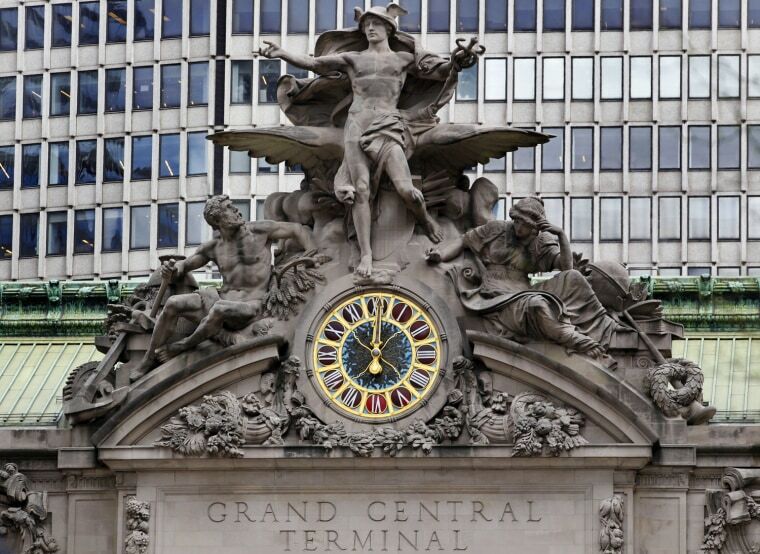 The terminal is often – and incorrectly – referred to as Grand Central Station. 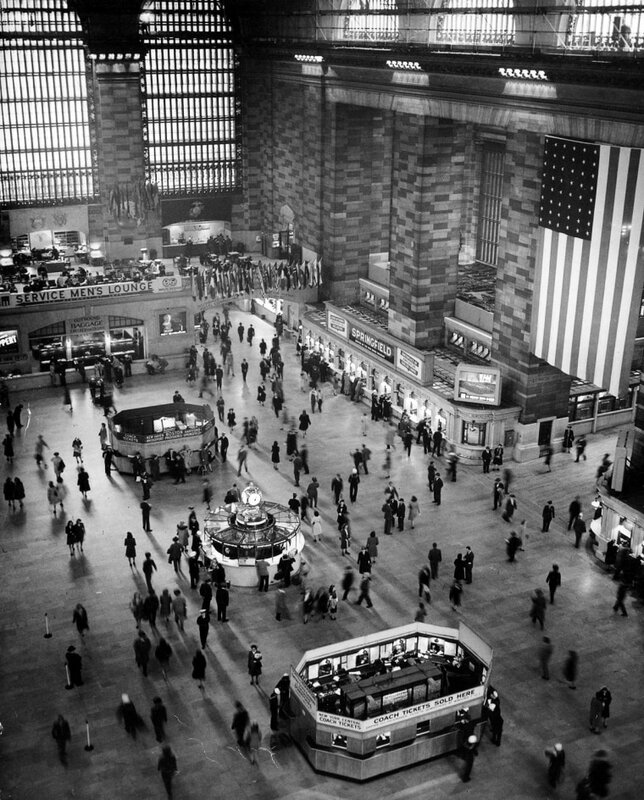 “I always say, if you call it Grand Central Station, then everyone knows you’re a tourist,” Ferate said. 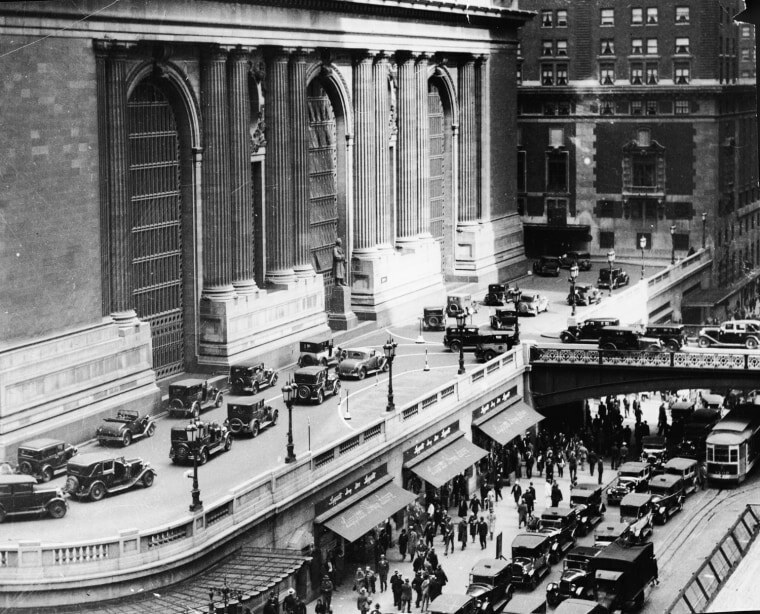 This 1930s photo shows a large group of pedestrians walking on the sidewalk below as cars drive above on the bifurcated and elevated section of Park Avenue which goes around Grand Central Terminal at the second floor to alleviate congestion. 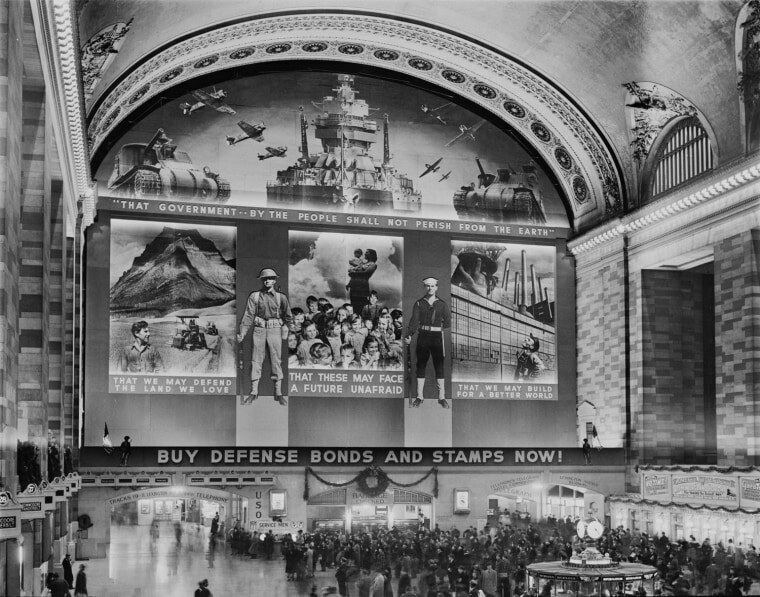 A mural, aimed to promote the sale of defense bonds and designed by the Farm Security Administration, is seen in the concourse of Grand Central Terminal in 1941. 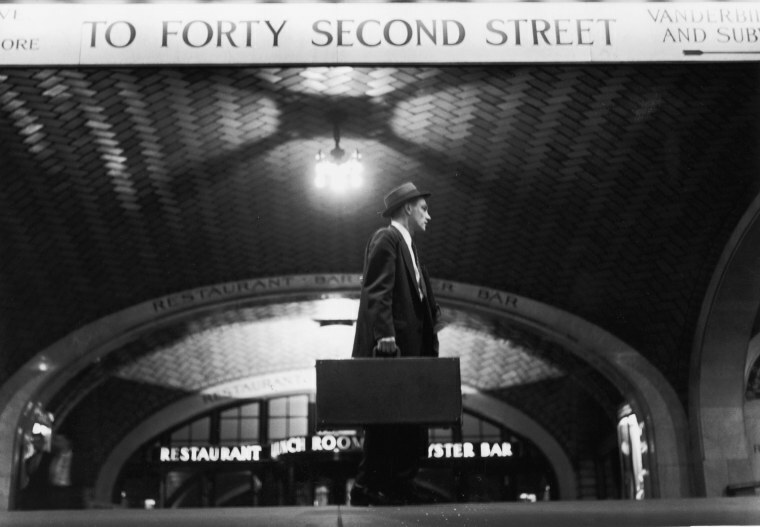 A salesman at Grand Central Terminal makes his way toward 42nd Street in this 1950s photograph. 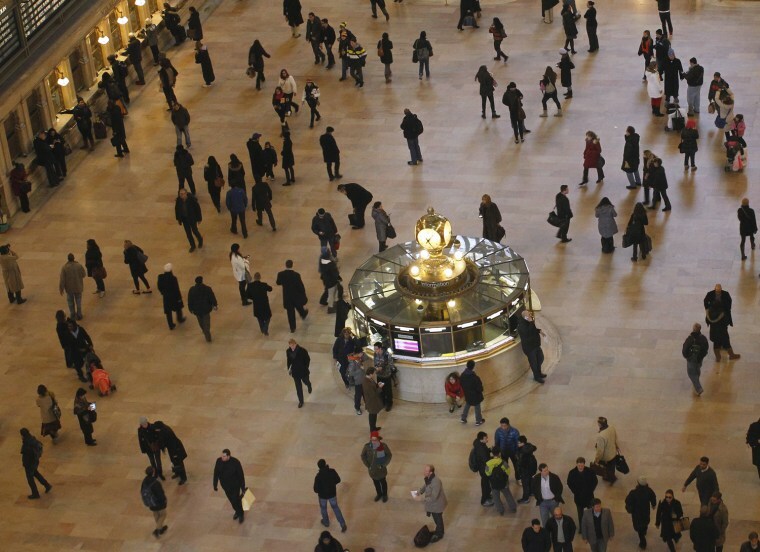 Today, about 750,000 people move through Grand Central every day, MTA estimates. Each block of stone on the floor of Grand Central Terminal is one walking step wide and one running step long, and each a slightly different color, Ferate said, and is designed to accommodate the human form. 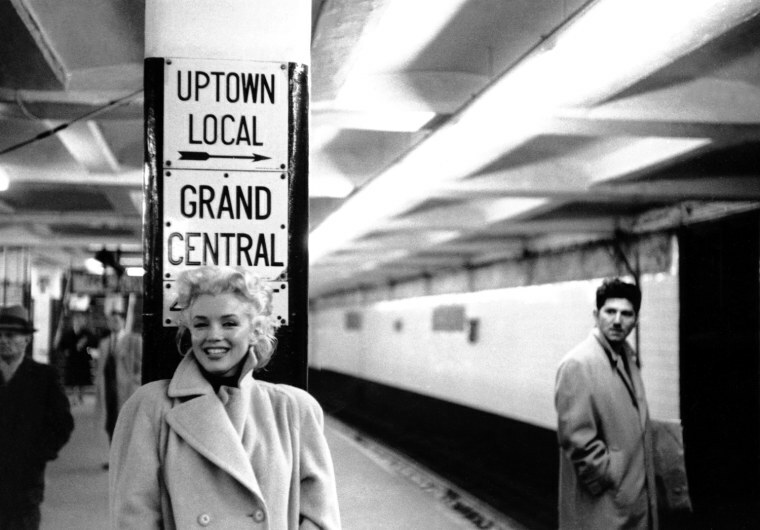 Actress Marilyn Monroe takes the subway in Grand Central Terminal on March 24, 1955. 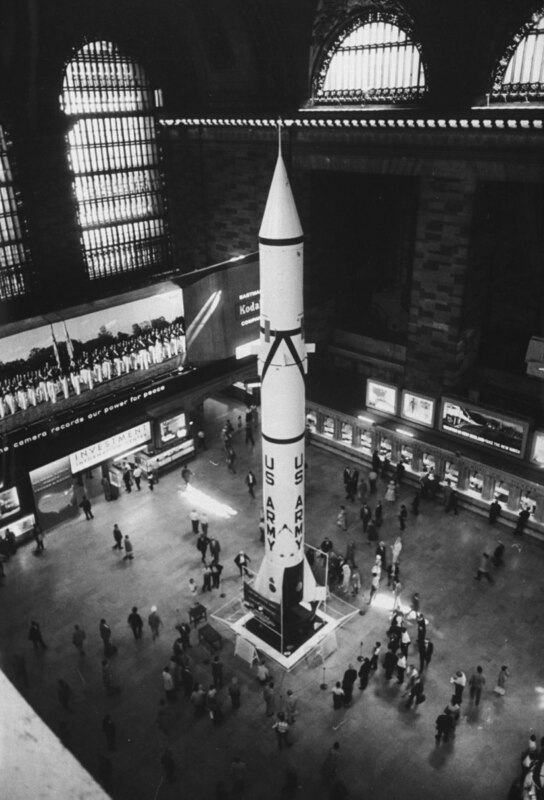 A 63-foot tall, 5-ton Redstone rocket was displayed at Grand Central Terminal in 1957. “They had exhibits of all kinds at all times … because it’s the great big public space that everybody knew,” Robins said. 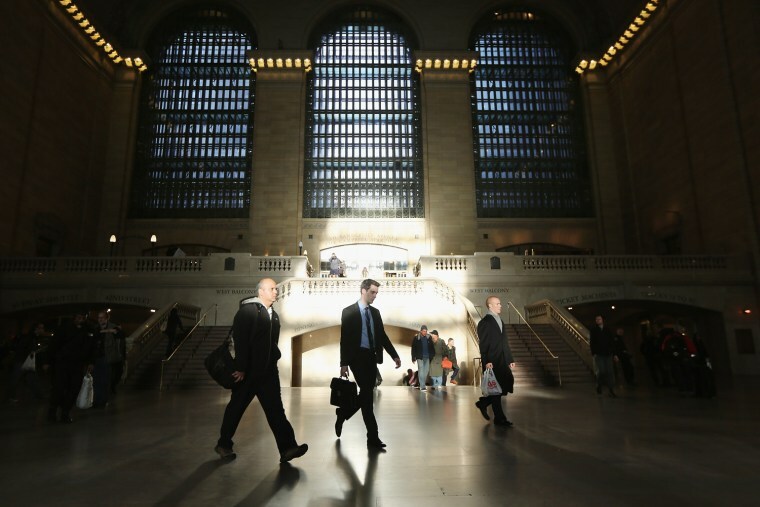 People walk through Grand Central Terminal during the morning rush in Manhattan on Nov. 1, 2012. Subway train service in the New York City was running at limited capacity following the system's shutdown caused by Superstorm Sandy. 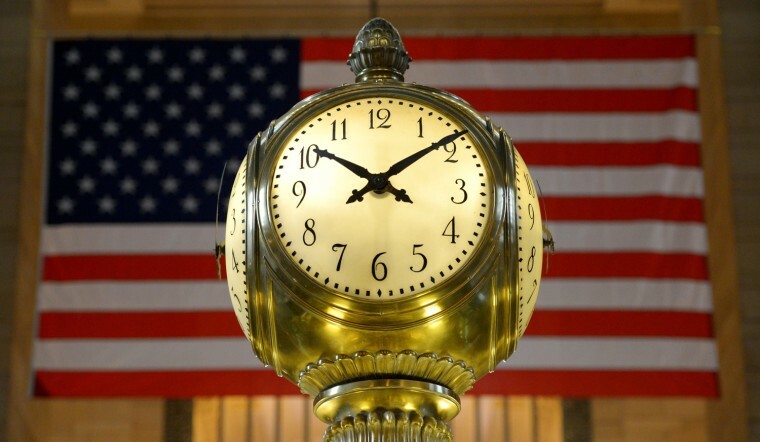 The clock on the south facing side of Grand Central Terminal strikes noon March 29, 2012. 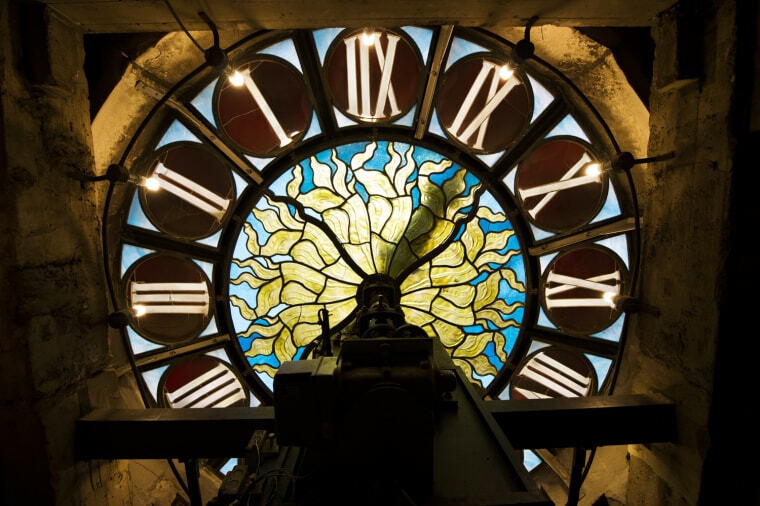 The view from the inside of the 14-foot Tiffany clock, the world's largest, at Grand Central Terminal, pictured on Jan. 29, 2013. 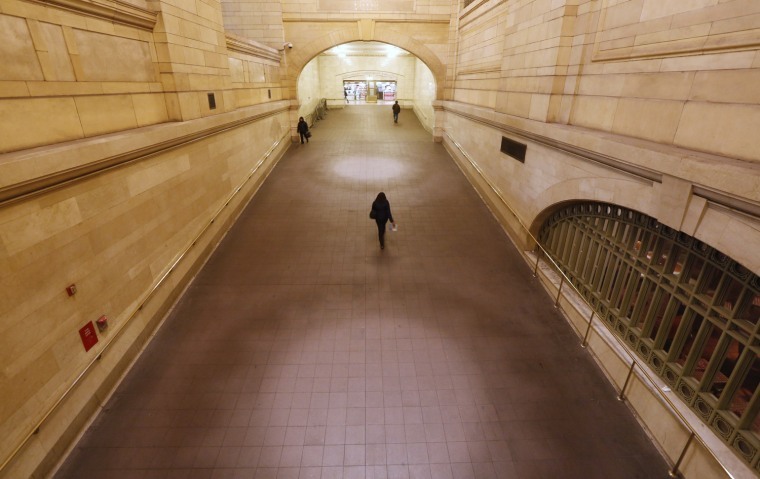 People use the ramp at Grand Central Terminal on Jan. 25, 2013. 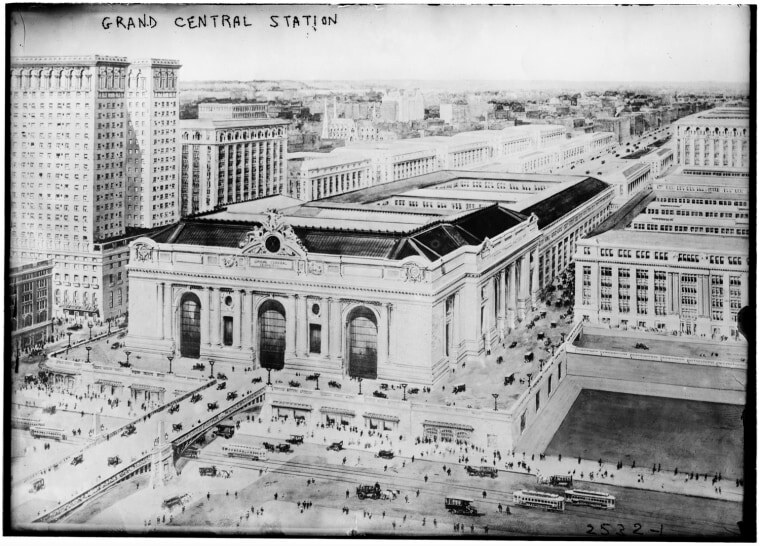 Grand Central had an extensive facelift in the 1990s and was nearly demolished about 55 years ago. 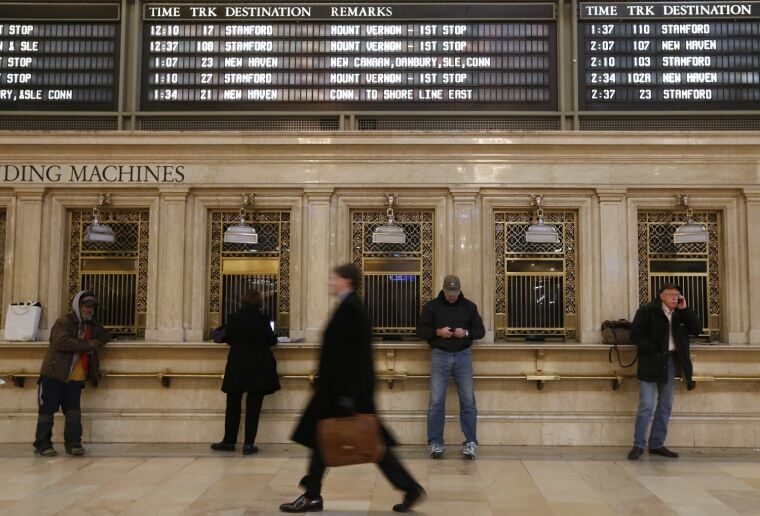 Commuters move through the grand hall of Grand Central Terminal on Jan. 25, 2013. The terminal, opened to the public 100 years ago, was then called the greatest railway terminal in the world and had an $80 million price tag. 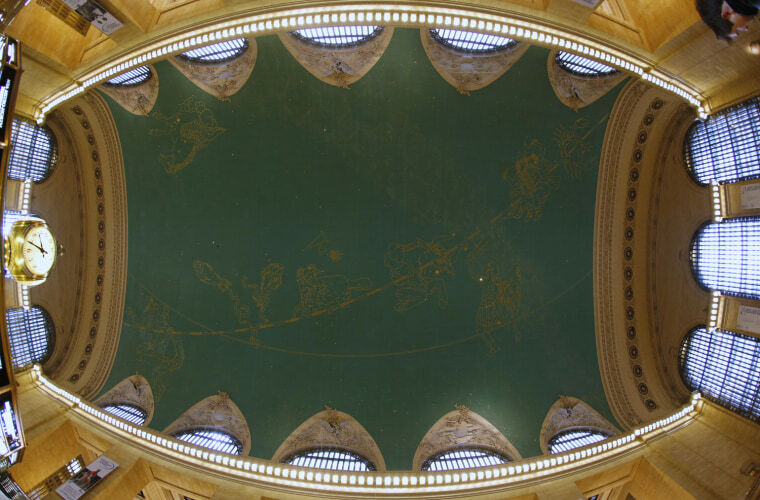 Grand Central Terminal is known for its “constellation ceiling” that depicts a starry sky and signs of the zodiac. 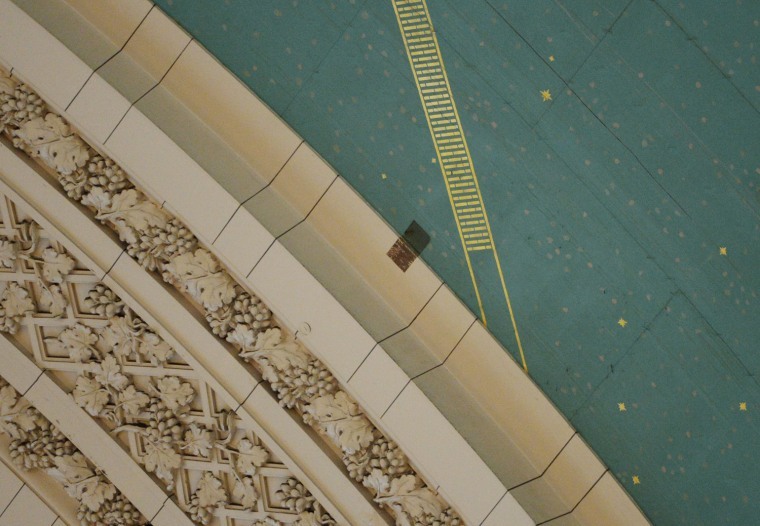 A small grey rectangle, pictured on Jan. 29, 2013, shows the darkened color of the marble and ceiling in the main concourse of Grand Central Terminal before it was restored in 1998. The dark spot was caused by cigarette smoke, Ferate said. Commuters move through the grand hall of Grand Central Terminal on Jan. 25, 2013. 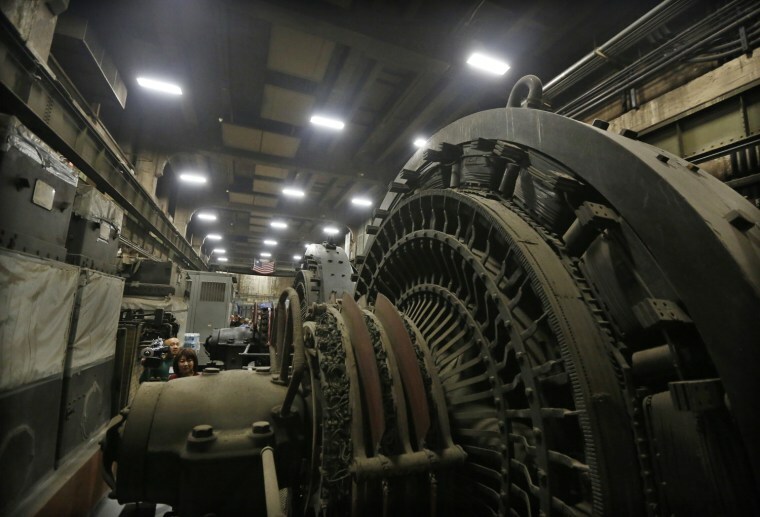 Giant power transformers sit seven stories below the main concourse in the power plant of Grand Central Terminal. Commuters move through the grand hall of Grand Central Terminal on Jan. 25, 2013. New York City is celebrating the 100th birthday with a public rededication ceremony, live performances and the opening of the “Grand by Design” exhibit. 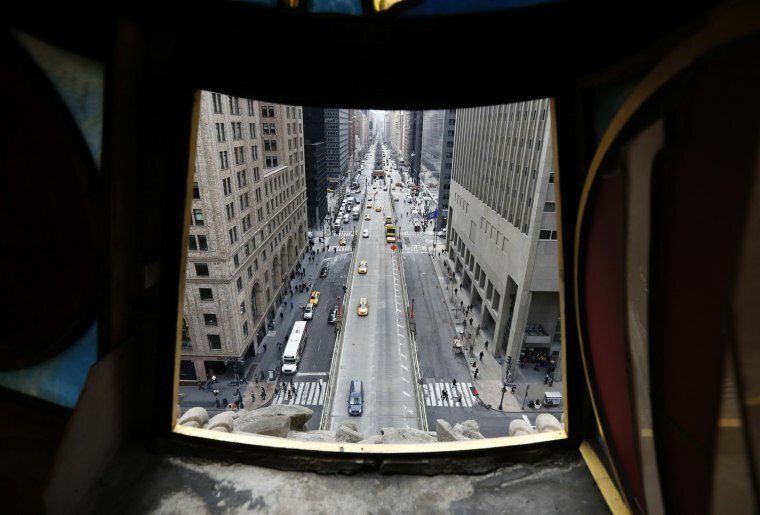 Park Avenue south direction is pictured from a view looking out from the Tiffany clock over Park Ave and 42nd Street at Grand Central Terminal on Jan. 25, 2013.